Use the code BLACKFRI15 at either my Hyena Cart or Etsy shops and enjoy 15% off of your order (before shipping). This code will only be valid on purchases on 11/26/10, and you will only get the discount if the code is used on the order (i.e. I will not refund the amount). I'm hopping up and down now that Etsy has rolled out coupon codes!! Yay! Enjoy your Thanksgiving with family and friends, and we'll "see" you on Friday! Scentsy: a great gift idea! I was introduced to Scentsy from my friend, Emily, who has become a Scentsy consultant after being won over by the product herself. I can see how it happens! I'm now hooked as well. 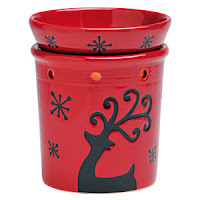 These are great products, and they make great gifts (hint hint) for those "hard to buy for" people who have everything! Basically, they are wickless "candles", and melt scented wax over a light bulb. They also double as a night light! Learn how they work here. My current favorite scents are Cinnamint, Sunkissed Citrus, and Christmas Cottage. 5. I like how they look! 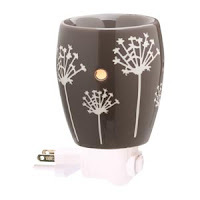 So, needless to say, I have 3 warmers in my house (2 of them are the plug-in version, which is great for small spaces because they don't take up counter room, and I can keep them away from the kidlets), and I think I might need one more. The Scentsy folks do tend to change the scent line periodically, so if you find something you love, you may want to stock up! If you are near a consultant, they have little samples of each scent that you can smell before ordering. Or, you can contact Emily and she'll be able to help describe them! You also don't need to have a "party" to get the product, you can just order directly! Thank you to everyone for your participation in my Anniversary giveaway! Congratulations to comment #8 - Isha! You win a pair of black longies with your choice of heart or star applique on the ankle. I'll work with you on the details when you respond (within 48 hours)! Isha said... 8 Found out about this giveaway from the Etsy Cloth Diaper Team Facebook page. Congrats on 2 successful years on Etsy! 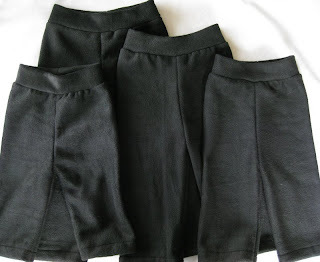 In celebration of my 2 year Etsy anniversary - I'm offering one winner a pair of my fleece longies (your choice of size and inseam). This pair will be solid black, with your choice of any color star or heart applique on one ankle (or plain). You may also choose to have the waist be the same color as the applique. My longies are a single layer (daytime use), and function as a diaper cover and clothing in one! They also work great over pocket diapers or AIOs for a little extra protection - plus they are sized for cloth diapers so they are roomier through the hips, with a higher rise than regular pants. You can find sizing information here.You can find them to purchase at my Hyena Cart store, or my Etsy shop! Always available for customs, and quick turnaround times!! Does your little one have chunky thighs? I can tailor them so they aren't too tight! I'm going to make this a simple contest! To enter: leave a comment here letting me know how you came to find this giveaway (if you can remember!). I'll choose a numbered comment using random.org on Friday November 19th, 9pm PST and post the winner here as well as direct email. The winner has 48 hours to respond or I'll choose a new winner. Please be sure your profile has contact info or you leave your email address in your comment. Open to all countries. This month, I'm celebrating having my Etsy shop open for 2 years! I can't believe it's been that long, and am so thankful to my wonderful customers for helping me to keep up my momentum. 3 clearance priced fabrics available - you choose the size! Available for a limited time, starting 11/10/10 on Hyena Cart.